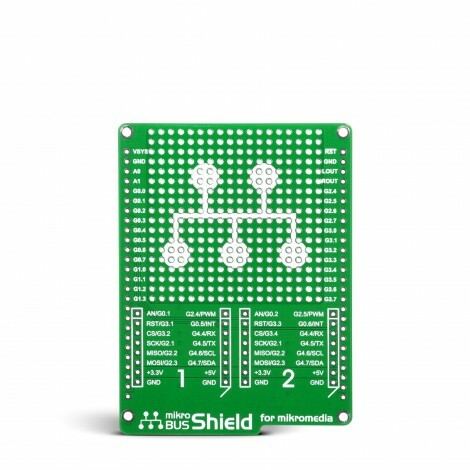 mikroBUS shield is an extension board pin-compatible with all mikromedia boards, that features two mikroBUS host sockets which allow you to connect dozens of Click boards. With this feature, you can provide desired additional functionality to your mikromedia board. Prototyping breadboard area is also available for placing additional components and expanding the base functionality with custom features. Board comes with two 1x26 pin female sockets, as well as four 1x8 female sockets for mikroBUS host connectors.